Football Friday nights are still happening in Ohio as the high school teams are competing for the state championships through next weekend. But today is a Saturday college football Big day in our house. It is the BIG football game between the Ohio State Buckeyes and the Michigan Wolverines. Even though the game will not affect the outcome of the OSU’s outstanding season, the rivalry between these 2 teams is fierce. 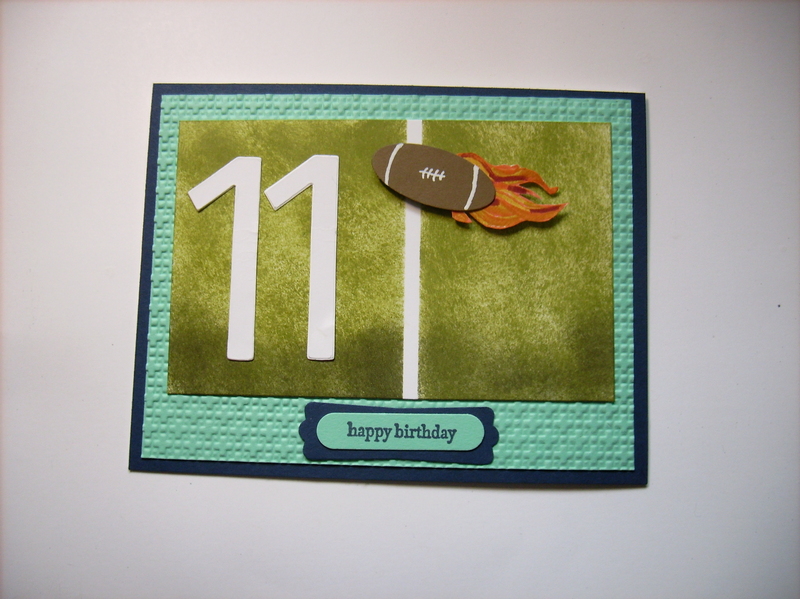 To show the love of the football season (high school and college) I chose this card that Cammie made for an 11 year old boys birthday as today’s post. Of course she brayered the background to resemble the grassy football field. She added a football made from an altered oval and dressed up with the white gel pen. She added some much needed flames to ensure the spiral pass made it across the line. Love this card and think it would be great for any football fan just by swapping out the team colors and the numbers. Thanksgiving is over and that means it is Black Friday and the Christmas season is upon us. The only one of the 3 sisters that participates in Black Friday sales is our baby sister, Blair. Cammie and I don’t get what all the excitement is about and we spend our day crafting or baking. For today’s card I kept the color scheme to a basic red and green theme. 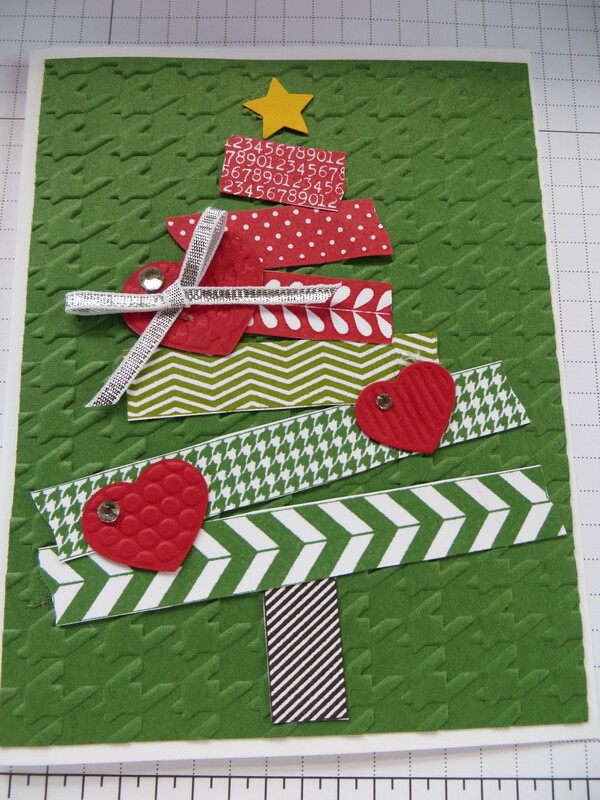 I stamped all the pieces of the Tape It #130715 stamp set in the Stampin Up annual catalog and then assembled my tree. I adorned it with hearts cut from the Fashionable Hearts Embosslits #125596 and a pretty silver bow tied from the 1/8″ silver ribbon #132137 in the Stampin Up holiday catalog. Happy Thanksgiving! I am so excited to unveil my Thanksgiving card because I “be-leaf” I did a fantastic job brayering and sponging all by myself! I took the lessons from my sister, Cammie and brayered and have finally branched out on my own. I added the woodgrain #128763 background stamp and then sponged to make it look like pieces of wood siding. I used a piece of grossgrain ribbon and wrapped it with twine before adding the stamped sentiment from the Tags 4 You #131823 and punched with the coordinating label bracket punch# 132153. I stamped the wonderful Magnificent Maple stamp #131868 in espresso directly on the woodgrain background. I then brayed whisper white cardstock with reds and oranges and then stamped the maple leaf again and cut it out and popped it on top of the espresso leaf. 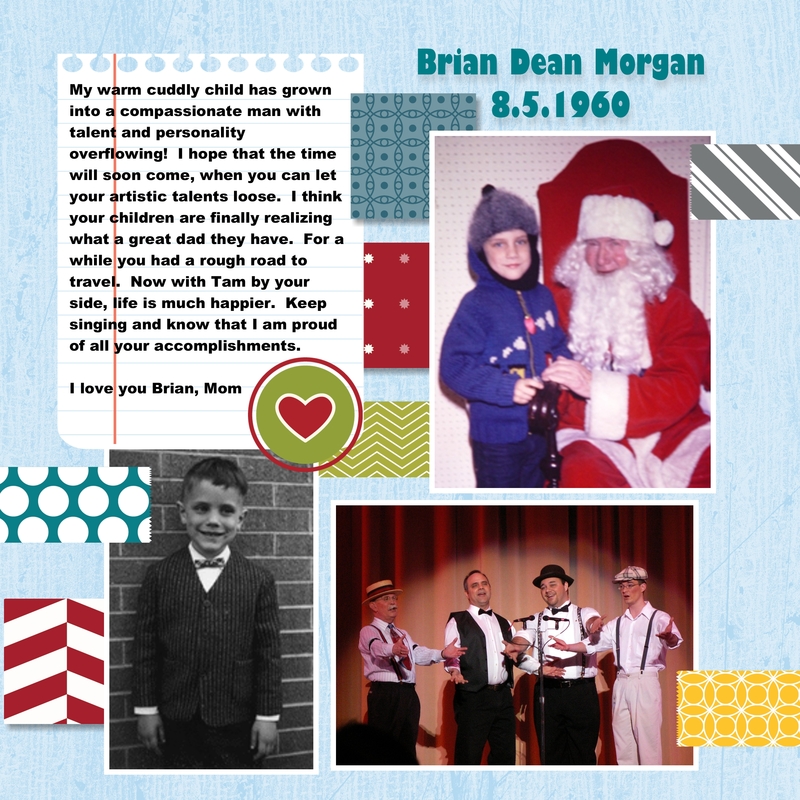 Wow I surprised myself with the finished card. So I must say I am thankful for all the lessons that my sister / upline has taught me to bring me into the world of brayering. 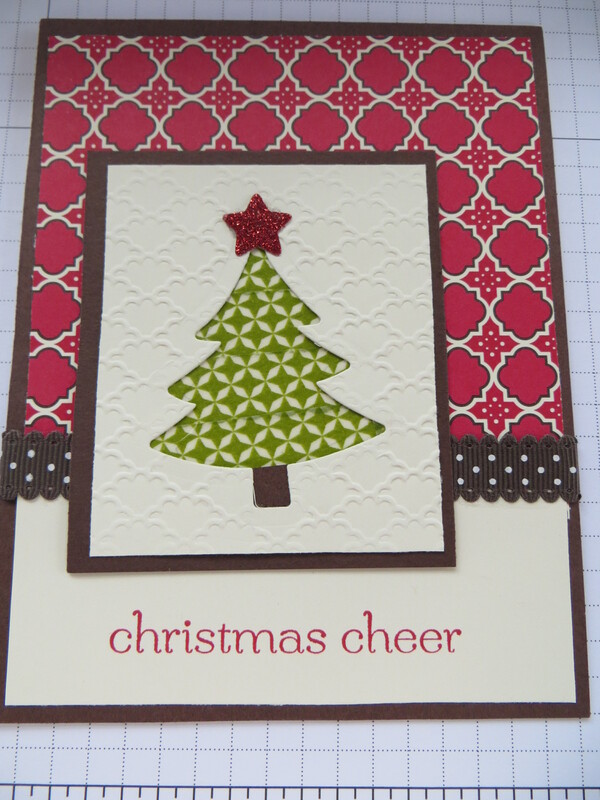 The Tags 4 You and the Magnificent Maple are available in the Stampin Up holiday catalog. The Tags 4 You and the Bracket Label punch are available as one of Stampin Ups Bundle and Save options. When purchased together (wood bundle #133593 and clear bundle #133294) you can save 15%. 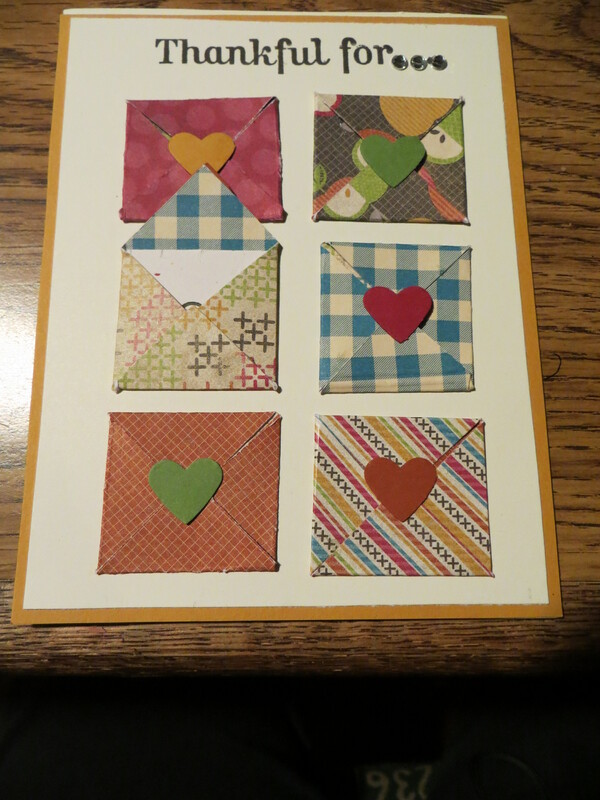 I was inspired to make this card when I saw something similar on Pinterest. I made each envelope from scrap DSP laying around on my work area and cut it into 1 7/8 ” squares and scored it at 1″ and 3/4″ on opposite sides. Each envelope is sealed shut with a coordinating heart except for the 1 I left open and but a message in for what I was thankful for. Pretty cute eh? 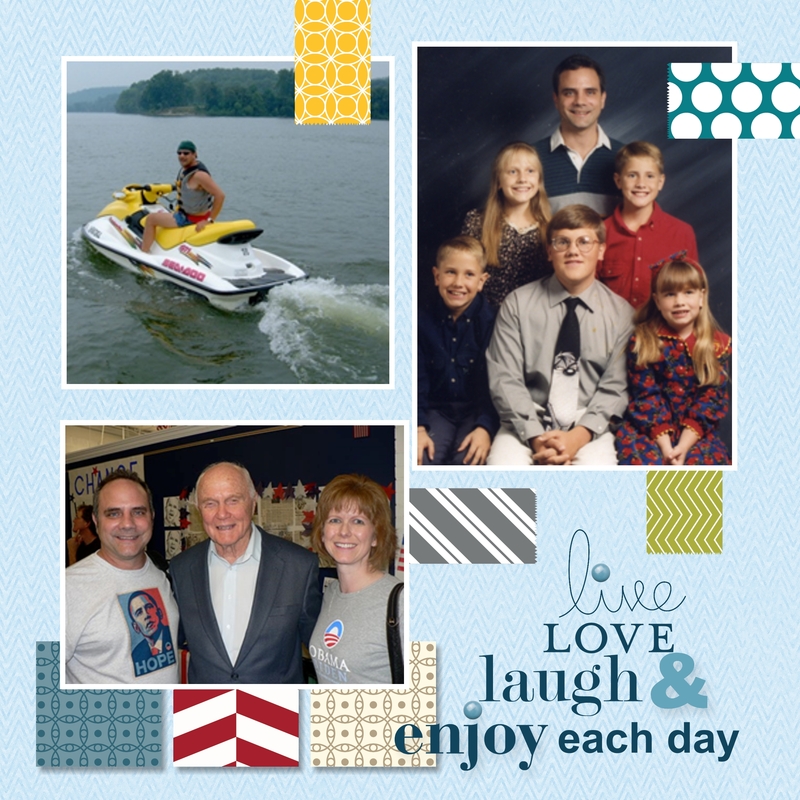 Today’s post is a 2-fer of Cammie’s Thanksgiving / Fall cards. Both of these cards are fantastic but the photo really does not do it justice. The cards are so different one has minimal stamping and 1 is heavy stamping. The background paper for the pumpkin card is a piece of the beautiful sweater weather DSP from the Stampin Up holiday catalog. The pumpkins were was stamped with the Everything Eleanor #124164 and then punched with oval punches and then pieced together #132184. She added hand cut stems and some leaves cut from the Little Leaves Sizzlits #114511. 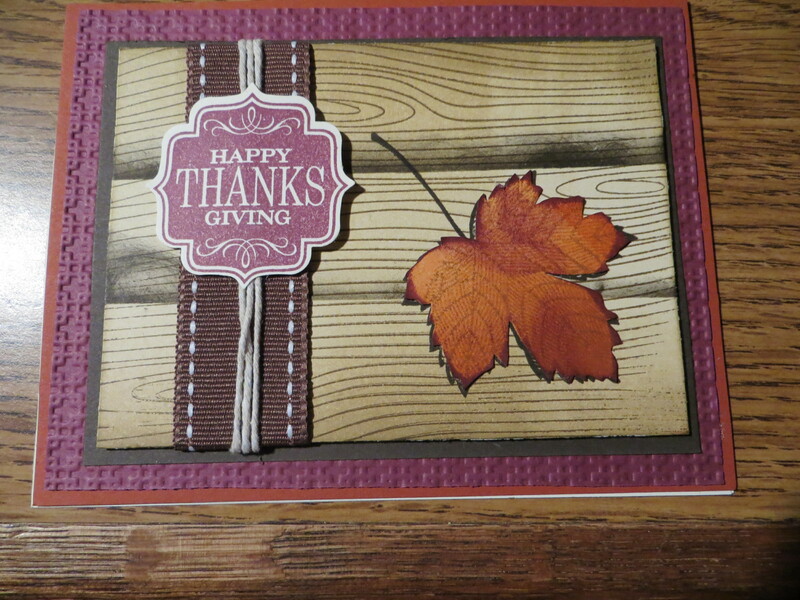 The Give Thanks sentiment is from a retired set but is mounted on 2 Artisan punched pieces #130920. The second card features the fabulous Magnificent Maple #131868 single stamp available in the Stampin Up holiday catalog. 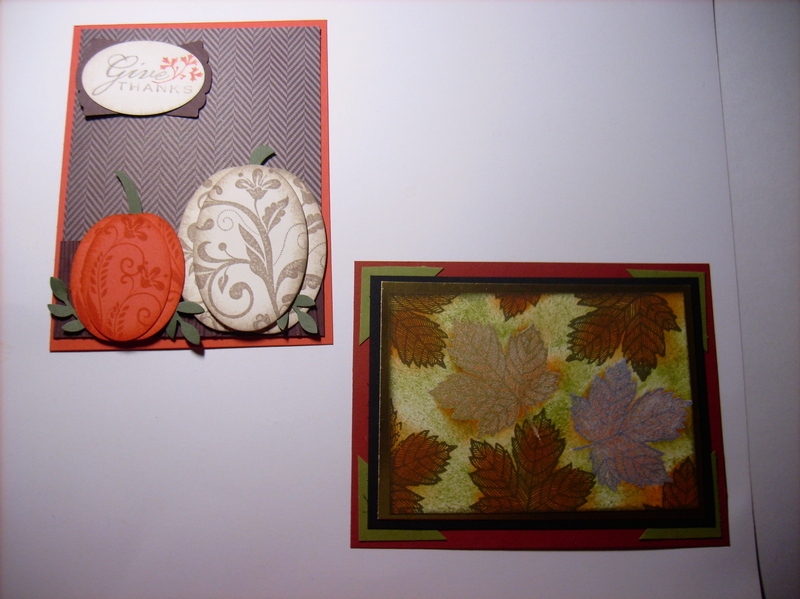 Cammie used lots of inks and daubers to create a fabulous fall foliage card.